Ironman European Championship: The winner of 2010 fights bravely for his finish after a tough day – “Three other athletes were just better today"
Frankfurt. Andreas Raelert has achieved fourth place at the Frankfurter Sparkasse Ironman European Championship today. The elder one of the Raelert-Brothers had a crash after 90 kilometers on the bike and fought bravely to the finish line. 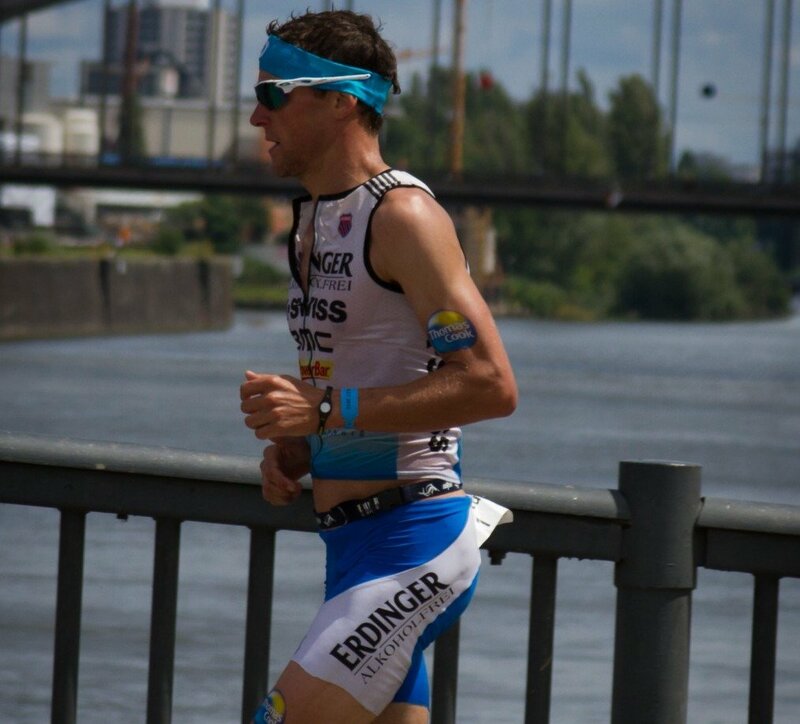 He crossed the line after 8:17:36 hours at the Romer in Frankfurt. Today’s winner was Marino Vanhoenacker from Belgium who claimed the victory in a tough race – ahead of Sebastian Kienle from Germany and Clemente Alonso (Spain). "It was a tough day for me”, Andreas Raelert said after his finish, “it was one of the hardest experiences in my whole career. I’m satisfied with my fourth place, because today I've given everything I had in my pockets. The 35-year old not only had to fight with strong rain, wind and cool temperatures in the beginning of the race and an emerging heat later on. Even more, the world record holder on the Ironman distance had a bike crash after 90 kilometers. He slipped away on the wet road, he hit the asphalt – but he stood up again and finished the bike course and even the whole race. “It absolutely was my fault”, Andreas Raelert mentioned, “before the crash I was in a good position – but after it I needed an extreme motivation. My friends, my family and all the amazing spectators around the course helped me on my way to the finish line." In the swim in the Lake Waldsee at Langen Andreas Raelert belonged to the lead group from the beginning. He came out of the water after fast 44:21 minutes in fifth position. “The swim was pretty good.” On the bike the 2010’s champion took over the lead after only a few of the 180 kilometers. After his crash he managed to catch up with the leaders again, but he lost time on his way back to Frankfurt. Andreas Raelert reached T2 with more than ten minutes behind Marino Vanhoenacker; he was in fifth position after the bike. In the marathon Andreas Raelert fought bravely until he was crossing the finish line after 8:17:36 hours. "I'm happy because I never gave up", he said at the Romer in Frankfurt. At kilometer 41 of the marathon he overtook Jan Raphael from Germany and finally reached fourth place. "Marino, Sebastian and Clemente were too strong for me. I congratulate them honestly and heartily." After the race Andreas Raelert received the diagnosis of a doctor: He has some bruises and abrasions and a light form of a concussion. The IRONMAN TV Show - Episode 5 featuring the Frankfurter Sparkasse IRONMAN European Championship in Frankfurt/Germany. Watch as Marino Vanhoenakcer crowns himself European Champion! We love to hear what you think in the comments. IRONMAN and INFRONT/HBS have partnered to deliver the best European IRONMAN action right to your TV. Past episodes can now be watched on YouTube. All rights reserved by the World Triathlon Corporation (WTC). If you have any further questions please contact Stefan Jaeger, Director PR Europe & South Africa (stefan . jaeger @ ironman.com).